The Supreme Court has upheld the right of a group of young Americans to sue the federal government over its treatment of the environment. After much stalling by both the Obama and the Trump administrations, the court date is confirmed for the last week in October. A date which could turn out to be bad news for the Trump administration, coming as it does a week before midterm elections. 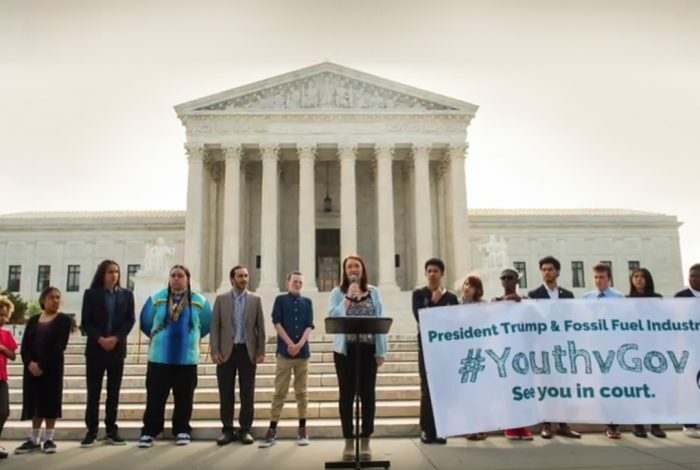 The young plaintiffs are claiming the government has robbed them of their future, an assertion that, if widely aired, might create dissonance around “family friendly” GOP candidates hoping to retain their majorities in both chambers of Congress this November. This court case is old, unlike the plaintiffs, and has been through a lot. It was originally filed against the Obama Administration in October 2015, by 21 children between the ages of seven and 18 collectively known as Our Children’s Trust. The Obama administration’s defense was that they were working with other nations to manage climate change, which made the plaintiff’s charges less sticky. Despite this, the United States Court of Appeals for the Ninth Circuit upheld the case, which the government then appealed. The litigation took on renewed vigor when self-proclaimed climate change denier Donald Trump moved into the White House, hired the now-disgraced Scott Pruitt to be his head of the Environmental Protection Agency (EPA), and pulled out of the Paris climate accord. This change in policy negated the previous administration’s defense that it was cooperating on finding ways to lessen climate change, and strengthened the plaintiffs’ case that their futures were being endangered. The current administration has pulled out all the stops to try to halt this case in its tracks. The last attempt was a counter-writ of mandamus — an unusual, rarely used legal maneuver. A writ of mandamus is essentially a higher court instructing a lower court (or other government body) to either hurry up and do its job, or to stop exceeding its powers. The Ninth Circuit Court of Appeals rejected the Trump administration’s counter-writ on March 7, ruling it “drastic and extraordinary.” The federal government appealed, and the case was taken all the way up to the Supreme Court. It unanimously ruled in favor of the plaintiffs on July 30, and decreed that they will indeed have their day in court. Images of poised young people criticizing the federal government are becoming more commonplace. The mobilization of the eloquent Parkland school shooting survivors has been a media phenomenon, and the desire of younger people to become active in defiance of government negligence has gathered pace since the new administration took control in January 2017. This will be a difficult news story for GOP politicians to explain away to newly minted voters — the plaintiffs’ peers — and their parents and grandparents, when asking for their votes during the last few days before the midterms. Related front page panorama photo credit: Adapted by WhoWhatWhy from sky (Eliza Tyrrell / Flickr – CC BY-NC-SA 2.0), Supreme Court ourt (Joe Ravi / Wikimedia – CC BY-SA 3.0), and Our Children’s Trust.